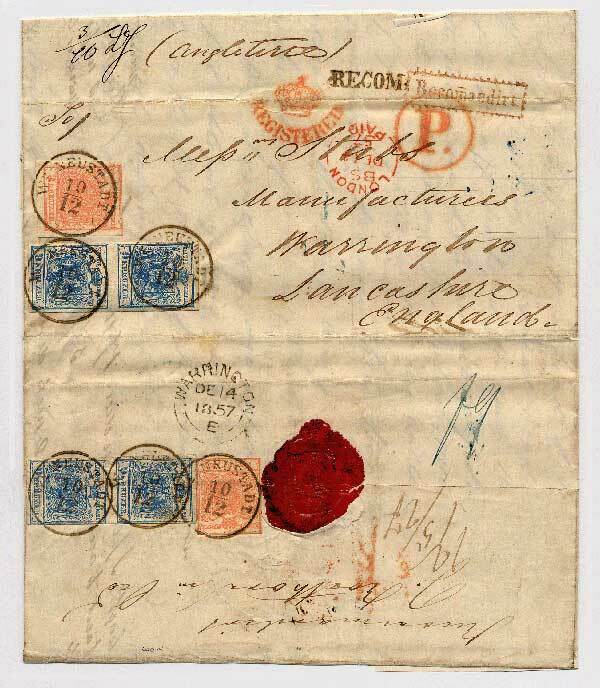 The picture shows the front and back of a letter which was mailed from Wiener Neustadt to Warrington in England on December 10th 1857, arriving on the 14th. The content of the letter concerns a request for manufacture of two especially designed pieces made of steel. The franking of 42 kreuzer consists of two vertical pairs of 9 kreuzer and two singles of 3 kreuzer stamps. The following is my concatenation of information from Henry Pollak in America, Franz Hochleutner in Vienna, and John Whiteside in Leeds; I thank them for their assistance. The rates to Great Britain as given in Ferchenbauer (5th edition page 40; 6th page 50) are perhaps somewhat confusing. Firstly, the money equivalents: Until 31/10/1858, 1 shilling sterling = 10 silbergroschen = 30 kreuzer CM; from 1/11/1858, 1 shilling sterling = 10 silbergroschen = 50 kreuzer ÖW. (For the younger readers, £1 sterling = 20 shillings = 240 pennies.) These are not exact, but are what were used as a basis for conversions, even after the new Austrian currency declined in value after 1859 and the loss of Lombardy. Secondly, one has to look at what was the normal route. This was via Prussia and Belgium from 1852 to the end of 1865, then via France from 1/1/1866 to July 1870, and then from July 1870, via Prussia and Belgium again. If mail was to be sent by other routes, it had to be clearly marked and paid for accordingly. Finally, the relevant measure of weight is the Zoll (ie the Customs) Loth. One Zollpfund contained 30 Loth and weighed 500 gram, so 1 Zoll-Loth = 16.67 gram. The normal Vienna weight was 1 Pfund = 32 Loth = 560 gram, so 1 Wiener-Loth = 17.5 gram. The Zoll-Loth was supposed to be used for all postal purposes, both internal and abroad, but often the Vienna one, which was by that time universal in the Austrian part of the Empire, was used instead. Since a Wiener-Loth is bigger than a Zoll-Loth, such laziness would have cost the Post Office money! From 1/8/1852, the rate to Great Britain was 7 silbergroschen (which converts to 21krCM) per (Zoll)loth and transit was via the exchange office at Aachen, through Belgium to Ostend, then via packet-boat to London. From Austria the Verein postal rate to Aachen was 9krCM per Zoll-loth and a further 12 kr was payable, making a total of 21 kreuzer (or 7 sgr). In accordance with normal Austrian practice, this was applied in stamps on the front. The registration fee was also 7 sgr, comprising the Verein fee of 2 sgr + British fee of 6d or 5 sgr, so a further 21 kr in stamps was applied, as was normal practice, to the back. For a short period from 1/11/1858 to 30/6/1859, under the new currency, the charge for a registered letter would have been 70 kreuzer ÖW. From 1/7/1859, the charges were greatly reduced: the postage became 5sgr and the registered fee was the Verein's fee of 2sgr only. Thus the fee for a registered letter from Austria was 35kr (25 + 10). It is not really true to say that the British fee was dropped, as the treaty stipulated that the parties should pay their own fee only. So mail from Great Britain that was registered was paid at the British fee of 6d. The political problems of 1864-1866 saw a change. Austria was suspended from the Verein and a new treaty was negotiated with Great Britain, so that the mail was now routed via France. It went at the French weight progression, so per quarter ounce or half loth at 25kr. The British registration fee was reduced to 4d on 1/2/1866 and if mail from Austria was registered the fee may have been 20kr, but Ferchenbauer is noticeably reticent about this point. The Franco-Prussian war saw the service via France suspended in July 1870 and the Austrian mail was again sent via Germany and Belgium. The postage was reduced to 2.5 silver groschen or 13kr. And the Verein registration fee of 2sgr or 10kr again became payable. This is not equivalent to 4d, as Ferchenbauer states, but on mail from Great Britain the British fee of 4d. was payable. This lasted until 1/7/1875, when the U.P.U. postage of 10kr applied and the foreign registration fee was also set at 10kr. Now to return to the 1857 letter. It would have travelled from Wiener Neustadt via Aachen in Prussia, Ostend in Belgium, and London on its 4-day journey to Warrington. The regular postal rate according to the German-Austrian postal agreement was 9 kreuzer, plus 6 kreuzer for registration, the same as it would have been internally within Austria at sufficiently large distance. The further franking from Aachen to England was 27 kreuzer, and is indicated in brown ink next to the seal on the back. 12 kreuzer was the regular letter rate from Aachen, and 15 kreuzer the registration fee. The brown figures are "weiterfranco" ['wf'] calculations: the Austrian post office is calculating what to charge the customer for postal services outside the Verein boundaries. The Verein's charges are 3 + 2 sgr, or 9 + 6 kr, so the wf charges are 12 postage + 15 reg = 27 kr, shown in blue as f9, or 9 sgr. In the top left corner of our letter there is a weight marking of 3/10 loth. This should be in (zoll)loth at 30 loth to the (zoll)pfund of 500 grams, as stipulated by the Verein regulations, so 3/10 loth is exactly 5g. However, Austria was somewhat reluctant to use the new-fangled weight system, so it is possible it is in Vienna weight, the (Wiener)pfund of 560g, divided into 32 loth, in which case 3/10 loth is 5.25g. At this level the difference is insignificant, but at higher weights it becomes more appreciable. A further complication is that weights were given to the nearest 1/10 loth only. Thus, '3/10', nominally 0.3 loth, actually includes weights from 0.25 to 0.3499 loth. For the two sizes of loth (and pfund) this means that '3/10 of a zoll-loth' covers weights from 4.167 to 5.832 grams, and '3/10 of a Wiener-loth' covers weights from 4.375 to 6.123 grams. The various registered marks now need to be examined. Use has been made of the 1993 book by James van der Linden, 'Marques de Passage'. RECOM. in black is applied on departure at Wiener Neustadt. The Recomandirt mark in a toothed frame is a standard type of Prussian mark, supplied from Berlin, which could have been applied anywhere, but was probably struck at Aachen. The brownish-red ink is the normal colour for this mark, almost everywhere it was applied. ©Andy Taylor. Corrected and updated 19 Nov 2000.